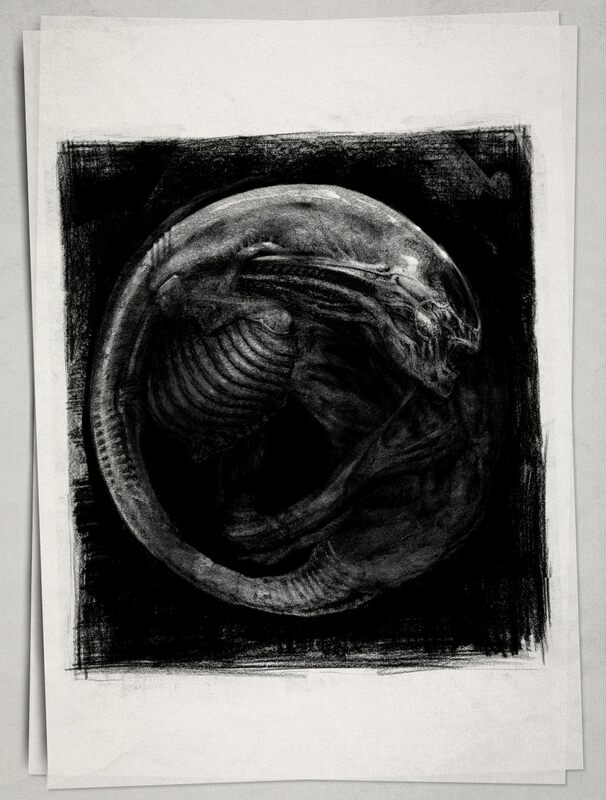 EXCLUSIVE: ALIEN: COVENANT - DAVID’S DRAWINGS Is A Must-Have For Xenomorph Fans | Birth.Movies.Death. 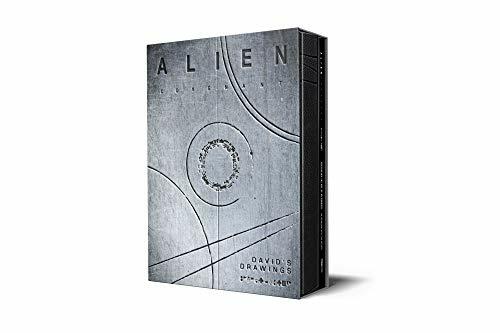 A few weeks ago, the folks at Titan Books asked if I'd be interested in taking a look at a new art-book set called Alien: Covenant - David's Drawings. Me being the raving Xenomorph fanboy that I am, I quickly said yes, and was absolutely blown away when the set arrived on my doorstep a few days later. 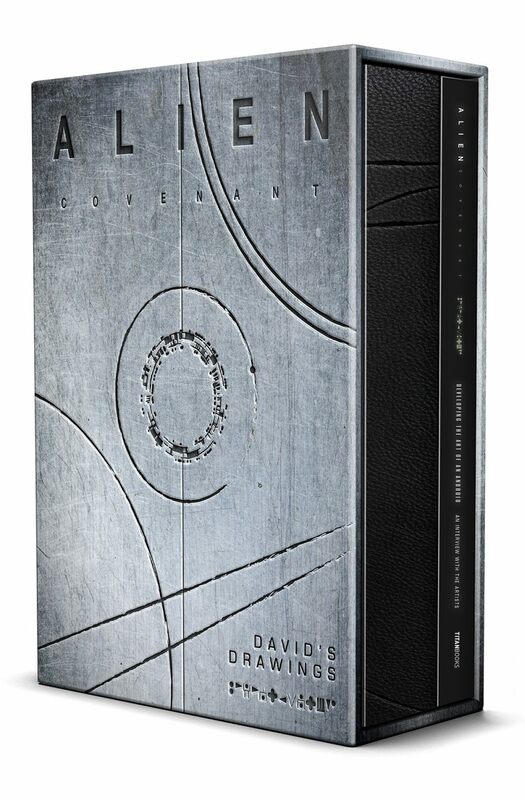 This two-volume set is overflowing with amazing, intricate drawings produced for Alien: Covenant, all of which were ostensibly created by David (Michael Fassbender), the mischievous android who wrecked so much havoc across Ridley Scott's last two Alien films. Also contained within its gorgeous, faux-metal slipcase: a volume featuring extensive interviews with the artists who actually created these fascinatingly morbid images. I spent an hour or so flipping through the whole thing before promptly agreeing to interview the set's chief architects - Matt Hatton and Dane Hallett. 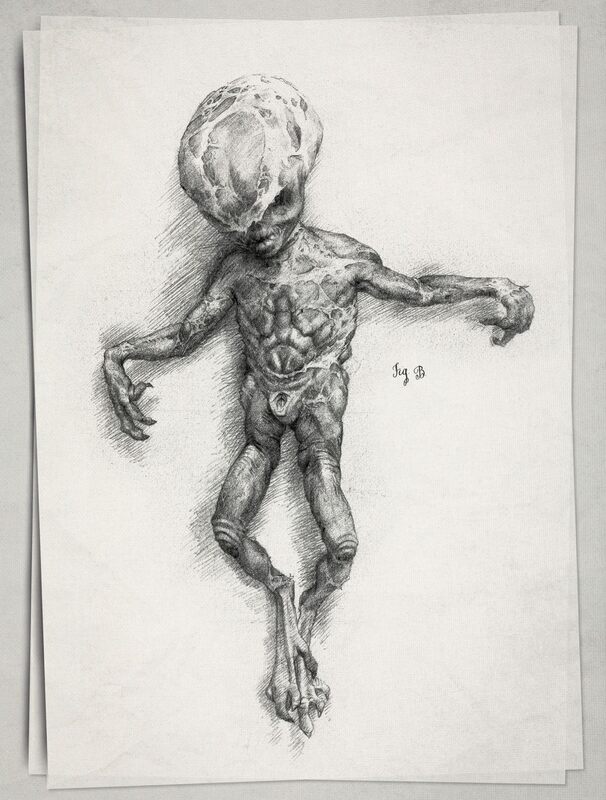 Below, please find a number of exclusive images from Alien: Covenant - David's Drawings (you can purchase your own copy here, if you like what you see), along with the results of my chat with Hatton and Hallett. This was a fascinating conversation, one worthy of the set that inspired it. Let's start with a basic overview. What're we looking at? Matt Hatton: The idea was just to present [David's drawings] in a classical pinned exhibit format and/or a Leonardo style (based on an early creature shop casting), with the multiple views. Seemingly objective and scientific, but the question is what has he been doing to get that foetus, which is obviously dead. Dane Hallett: In terms of the [images seen in this post], they're mostly taken from the Lab set. While Matt perfected the Elizabeth Shaw drawings, I dove into this massive set, spewing as many drawings out in the limited time I had - and loved every minute of it! 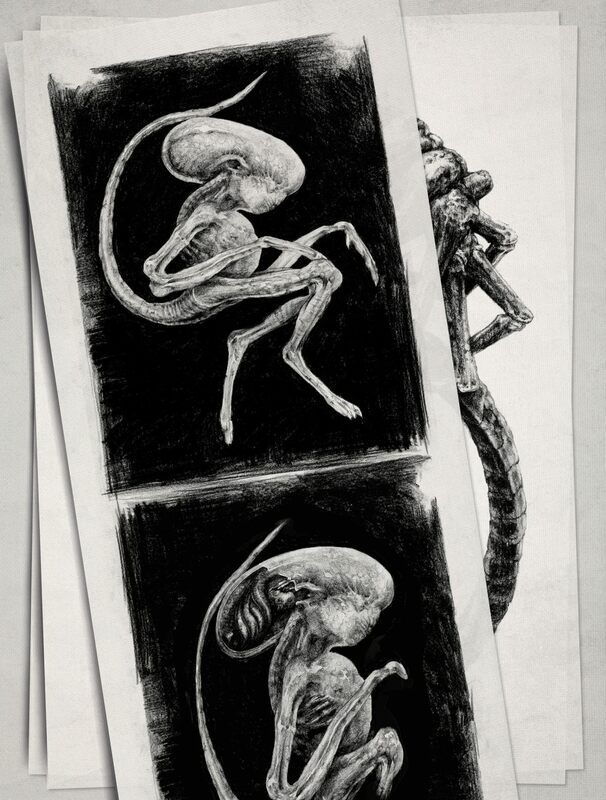 Probably the coolest thing about those images is the fact that the great Adam Johanson of the Academy Award-winning Odd studios took the Spliced Neomorph design and physically sculpted it into a beautiful work of art that features in the film. It's special moments like that, that still blow my mind! So, how closely involved was Ridley Scott in the creation of this set? Dane: As Ridley's affection for Matt and my work increased, so too did his involvement (and the demand for more artwork). Our illustrations featured in three sets that pertained to David, serving as a parallel storytelling device that chronicled his descent into madness. Upon walking into our first set, Ridley was only too happy to zero in on us and begin a journey of feedback and progress. He was particularly invested in the gory crescendo that depicted Elizabeth Shaw meeting her fate, all of which was expertly handled by Matt. I say all this in addition to the fact that I suspect it was his genuine adoration for fine art that prompted the initial conceit of an android expressing the loss of his sanity via a literal tapestry in the first place, so in that sense, he was critical in its creation. What's it like trying to get into the headspace of an android? Dane: As a kid who never grew up, it was simply exquisite. What's not to love about inhabiting the mental sandbox of an android with space dementia who is hell-bent on extinguishing all pre-existing forms of life by spawning a new, perfect organism whose structural perfection is matched only by its hostility?! Matt and I are both such massive fans of the original Alien, and to explore the themes touched upon in that film via the character of David, in such an artistic (and often gruesome) way was a legitimate dream come true. Matt: For me it was like the research an actor would do for the character. It was fun getting into his mode of thinking based on the confluence of his situation and influences, and how as we progress from scene to scene in the movie (the book is more a document of the imagery) his mind unravels. And peppering the scientific notation with little hints to the backstory and his mental state. Getting into that mode helped generate certain drawings I wouldn’t have otherwise come up with and helped with overall consistency. 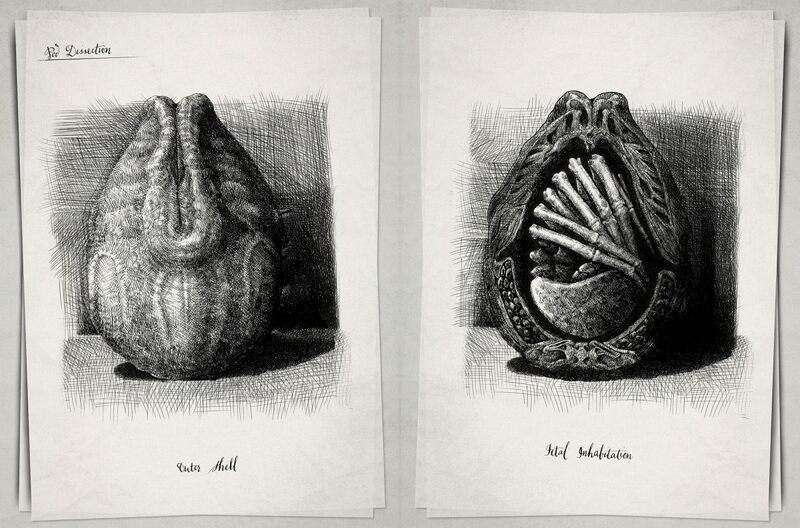 Did you have a sense, while creating these drawings, how long David had been conducting his experiments? Matt: Yes. I think there was a ten year timespan between the events of the two films. So plenty of time for shenanigans! This franchise has introduced a number of interesting alien organisms over the years. Which do you find the most compelling, and why? Dane: Oh dear, the Sophie's choice of the Alien world! Since childhood, I have been truly enchanted by insects and reptiles. As such, there were so many aspects of the Xenomorph life cycle that enraptured my unsuspecting, juvenile brain. 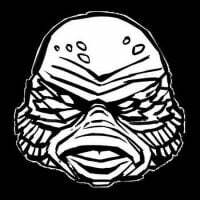 I realize it's a bit of a cop-out to cover all the bases of the Big Chap's many forms by saying 'The Alien', but it was that perfectly-considered (and horrific) life cycle/system that had me genuinely obsessed. The believability of an organism practically engineered to infect a specific host, not unlike the Cordyceps or Isopods, had my gaze locked lovingly into the void behind that phallic dome. Watching every incarnation of the Alien take a victim is as enthralling as watching a Tarantula hawk dominate an otherwise lurid spider and haul it into its lair until its young burst forth from the host abdomen. Hell, it's still hard for me to get over just how cool the egg is! Matt: So hard to choose one. I adore everything in the first movie design wise (including the mysterious space jockey). But maybe we should single out for once how brilliant the final look of the facehugger in the original movie was, both aesthetically and psychologically: a giant spider, that sticks its, uh, tube down your throat? With a tail for both attack and defence/constriction/control? That’s a pretty concise and effective design for scaring pretty much everyone! My next favourite to the first movie’s creatures would be the elegance of the dog alien’s design and balance. It conveys that the creature is both lethal and refined in its intent/purpose. Did you create any of your own "David mythology" while creating these images? Any backstory that wasn't provided for you? Dane: David's actions, as described in the script, gave us an excellent understanding of his psyche, so that was a great jumping off point. But Matt and I are both so heavily steeped in the themes of the Alien universe that it didn't take long before we were entrusted to pretty much represent the character of David in all forms beyond his physical appearance. The illustrations and accompanying text were allowed to evolve at our discretion, which means that I personally consider every drawing and notation a part of Davids mythology. Specifically, I would make artistic choices while thinking of him as a character who was capable of true love in the way that a calculated serial killer might believe that they too 'truly love' their victims, as such, there are quite a few deformed (post experimented on) engineers in my catalog. Matt: Yep. As above, getting into the character’s sociopathy meant thinking of what he might have been up to. I popped in little stories about the plant that looked a little like a native spider and implications of narrow escapes from those spiders, undersea journeys and so on. One thing that people have commented on was the aesthetic discrepancy between the monolithic classical structures of the city and Engineers themselves, and the Giger aesthetic in the spacesuits they wear and ships they fly. It was my first big question on reading the script. Beyond the obvious visual metaphors referencing classical architecture and Michelangelo’s David as visual shorthand to tell the audience this was an ancient and powerful race, I tried in my little way to use the progress of civilization and technology to bridge the seeming anachronism. So when they achieved space travel and moved beyond functional shapes and structures, aesthetics became more of a concern. By putting that classic Giger shape language into the drawings of their native flora and fauna, Dane and I showed that the engineers were referencing the obvious for this very divergent look. There’s a visual segue between functional/just mechanical pipes and forms on spaceships to the more elegant details on the juggernaut/derelict. And you can infer through the internal logic/look and structures/shape language of the imagery/their native surroundings that biomechanics was indeed an evolution not an anachronism. I had David seeing their city and vast structures enduring even through their advancement as evidence of hubris. Of course! The final thing was what happened to Shaw. While we knew she was dead by the time of Covenant and told that she’s been brutally tortured and to show that, we weren’t given specifics. Beyond some wonderfully florid general directives! For my part, I thought that things would be creepier if the reality of the events were implied/open for debate. The general thrust of Covenant is more literal and plot-based, so it seemed both less redundant and more thematic to take a non-literal approach there. Because your imagination is always more terrible. And it opens things up instead of stifling your own creative imaginings. So I used metaphorical and religious/blasphemous imagery to infer that while we know she died, who knows which or all of these images were true? David is the unreliable narrator, and has some figurative (and yep probably literal as well) screws loose. Religion is also a constant theme with these two movies, and most sci-fi is inherently existential in the end. So it follows that these may be a record of what he actually did, or may not. They could be different plans for what he was going to do/just drawings - a nasty comment on his gaining true creativity in a horribly human way. He may have even killed and resurrected her multiple times - we saw in Prometheus they could reanimate a corpse. He both worships and abhors her, it’s not just one nor the other. But Alien, and Giger are so thematically and metaphorically rich it seemed both in character and true to the imagery of the series to not be so literal-minded here. The ambiguity and even the seemingly contradictory nature of the images was absolutely intentional. I know it’s gratifying to cross the T and dot the I, but I love the idea of imagery opening things up too. Some people see the horrible fate/fates of Shaw as some kind of hate for the character, but for me having an appropriately horrified reaction proves that we cared for her and simultaneously shows in an awful way just what a monster (under the surface) David has become. And his love/hate of humanity personified in Shaw makes it more than just your usual gory slasher flick. What makes this set a must-own for Alien fans? Dane: Being a part of the very same fan community that obsesses over every little detail within the mysterious world of the Xenomorph, I know that even the tiniest morsel of text or visual information contained therein is laden with both Matt and my very best efforts to honor a legacy that has shaped so much of our love of design and cinema as a whole. Our affection goes beyond a professional one, and personally, I hope that the passion translates as such. Matt: Boy that’s a hard one - maybe just that Dane and I both grew up on Alien and as lifelong fans we put heart and soul into doing our best on these images, and tried to live up to the legacy. And it’s great to see them put down in book form. All I can say is that as fans this is the sort of thing we’d love to sink our teeth into, even if we’d had nothing to do with it! 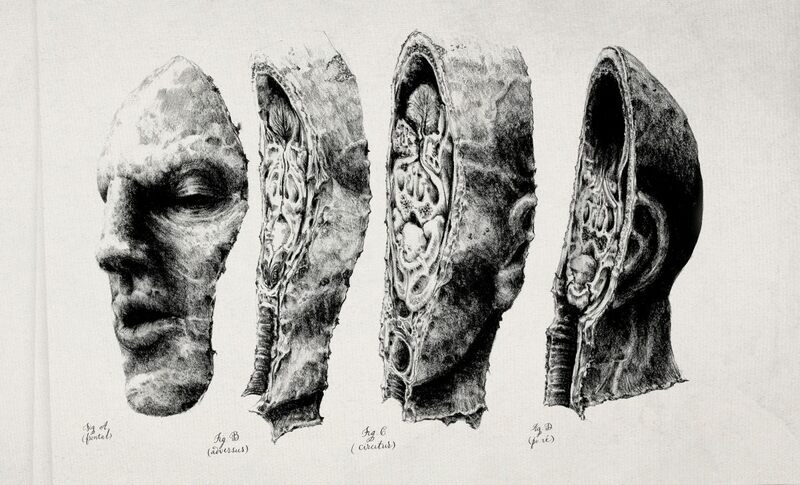 If you're an Alien supernerd (and/or an art nerd) like me, I really cannot recommend Alien: Covenant - David's Drawings enough. The work Hatton and Hallett produced here is remarkable, and the presentation of the set itself - from its faux-metal slipcase to the high-quality reproductions of the original sketches - is top-notch. Get yours here, and special thanks once again to the folks at Titan Books, Matt Hatton and Dean Hallett for taking the time to answer our questions about it.